that left smooth edges on my tin cans after opening. Not only did it spare me occasional blood shed, it provided containers that could be used for a wide variety of purposes. Tin cans can be used to store pencils, markers, paint brushes, crayons, small toys etc. It is fun to decorate, paint or cover the outside of your can, personalizing it for its intended use. You can cover cans with wrapping, construction, colored or contact paper, even fabric. 1. 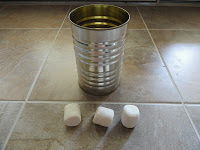 An empty tin can or combination of cans. Ages: anyone who is interested age 2 – 92… really! School age, Tweens and Teens will be able to think of more complex rules and challenges. Remember… the younger the child the larger the opening should be; and, the closer the throw line should be to the can. 1. Line several cans up in a row. Decide on a throwing line. This can be a line in the tile or a piece of masking tape placed on the floor. added at the top, middle and bottom give your target more stability. 3. Points can be assigned to each can, if desired. Write the number of points on each can. 3. Lay a can on its side. Use a ruler or yardstick to “putt” your ball into the can. Can you think of other ways to play?